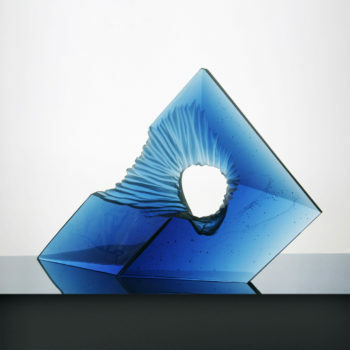 The blue sculpture was created as a result of smelting down glass with the uranium. Blue explosion is expressed by hole with grinded beams running around its circumference evoking under water explosion, which is both massive and quiet. This art work gives calm feeling with the tension of the explosion and sharpness of the edges. These factors were highly important for my further development as an artist, because they supported my interest in sharp edges and light penetration. The focus of my dissertation was the instability and sharpness, from both visual and feel perspective. I decide to connect these two factors to reach votive element in my final object, which would enhance the feelings of the audience. 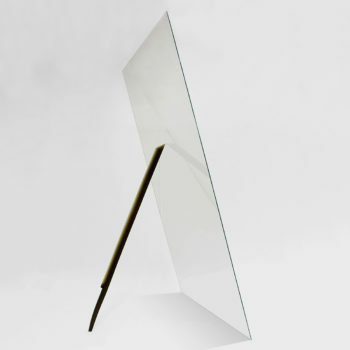 The main purpose of this art work was to evoke the sharpness of glass in combination with the feeling of danger from its potential falling or injury due to its sharp edges. This object is demanding in terms of space and techniques of light transmission, which results in the construct of two colours. I was inspired to create this art work by the concept of instability, primarily by the instability from the visual prospective. This composition is made of different segments of triangular shapes with a disturbance of one piece of circular shape. The whole composition is held by only one string running around its circumference. The major purpose and thought of this composition were to demonstrate creative approach to object fixation without the use of glue products. I liked the challenge in applying such approach on complicated installation, which is locked in together and continuously pulled to its core. 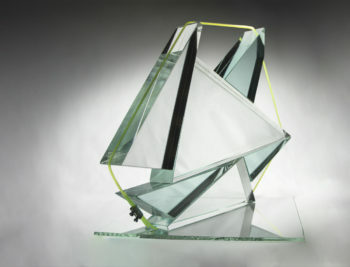 I used triangular shapes to evoke the feelings of sharpness and fragility of the glass object. 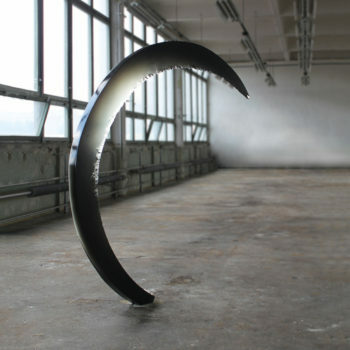 I created within the project of unstable stability several such objects of different compositions, shapes and sizes. I focused on the sharpness and shine of blades. 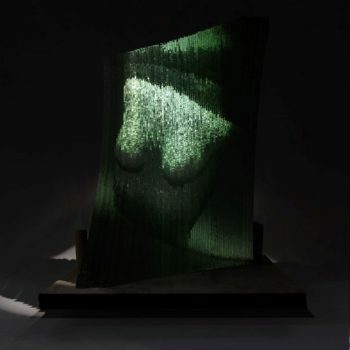 The main goal of this art work was to emphasize the sharpness of the glass in respect to the metal used. The importance was given to the fragility, light penetration and perfect processing. The installation of the object is playing with stability, which is one of the factors I focus on in my art work. The main carrier element is the glass katana, which is perfectly sharpened and as such represents the type of blade important in samurai swords. 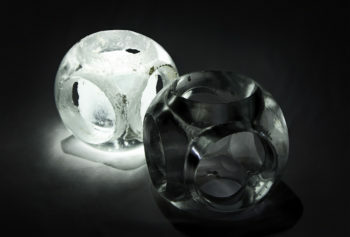 I attempted to use the classical grinding glass technique to create two ordinary crystal cylinders, however with the addition of my innovative thought of grinding them by the décor from the inside. I got really interested in this technique, because this style is hardly used in the traditional glass grinding. It was really demanding work due to the fine stone grinding, but the result was a great representation of traditional glass grinding technique, which evoked the feeling of innovation, contrast and cleanness. Even though I spent most of my childhood in the nature, I come from Usti and Labem city, Czech Republic. Is started to work with glass at early age, and soon enough I became fascinated by this material. I love to create art work for pleasure of others, but also for my own. The work with different materials and their reshaping is really fulfilling for me. My passion is working with sharp edges, perfect surfaces and colour transitions, and I know that with hard work, glass material can bring all these aspects together. My art work brings me both relaxation and happiness, and it became over time a way of life rather than just source of income.